STICKBALL IS BACK THIS LABOR DAY! We have the room block for our 2019 Labor Day Tournament ready for you to book your rooms. You have until August 9th to book your rooms at this discounted rate, HOWEVER, we are only guaranteed a certain amount of rooms. So the earlier you book your room, the better so that we can ask for more rooms if necessary. If you wait until the last minute and the block is full, there may not be anything we can do. To book your room, it is pretty easy, go on the link below or call the number below and tell them you are with the 2019 Stickball Tournament. The rate is $165/night, but is based on double occupancy. So those of you planning on having more than 2 guys in a room, I wouldn't tell them that, otherwise the rate goes up $10 per night for every extra person you have (i.e. $175 for 3 people, $185 for 4). When you click on the link, there is an option for 1 King bed or 2 Double beds. Also, the hotel has a complimentary shuttle to and from the airport, you can inquire about that when you make your reservations. If you have any questions, please let me know. Looking forward to seeing you guys in May, and again in September! 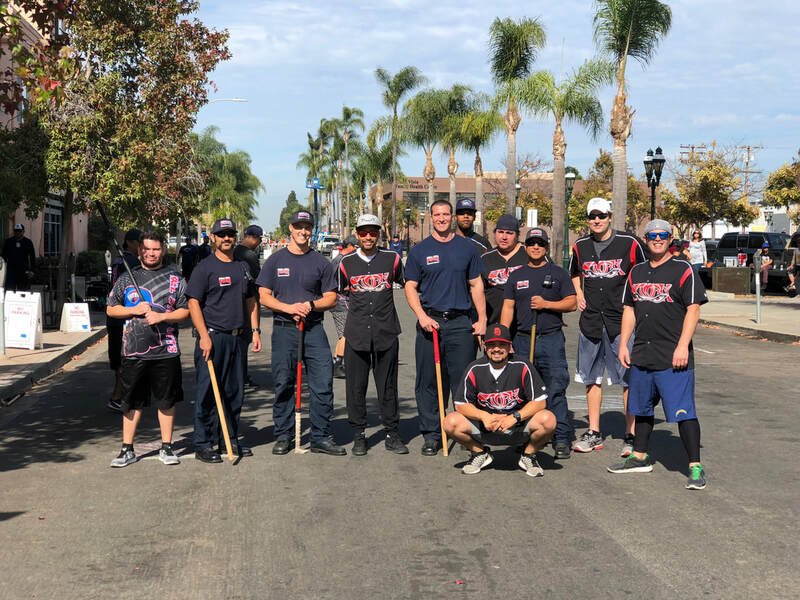 STICKBALL HITS THE CHULA VISTA STREETS! The Field is set for our upcoming Labor Day Tournament! This years Friday night event will be hosted by KO Underground Brewery. We will host a silent auction from 7:00 PM- 9:00.PM. Drinks and Food will be served along with a live DJ to get the party started. WE HIGHLY ENCOURAGE ALL PLAYERS ATTEND! This will be a great event with proceeds going to our league. More info will be provided in the coming weeks! Please Contact Sandiegostickball@gmail.com if you would like to help with the event. May 15, 2018-- We are officially open for registration for full teams for our 20th Annual Labor Day Stickball tournament in Little Italy. The tournament will run from Saturday, September 1st through Monday, September 3rd. We will have up to 16 teams in this year's event, maybe even including a team from the East Coast. Please continue to check our website and Facebook page for updated information in the coming weeks. To register, please visit our contact form below and email Sandiegostickball@gmail.com. It will be $325/team to participate and your team must have matching uniforms for the event. Payment must be made by August 15th to secure a spot. May 15, 2018 -- Our very own San Diego Street Rookies will be heading to New York next week to represent the west coast stickballers! We will have plenty of coverage of the Memorial Day Tournament in a few weeks. Make sure to check our facebook and instagram for live updates! May 19, 2017 -- Registration opened just over a week ago for the 19th Annual Labor Day Stickball Tournament in Little Italy. 11 of the 16 available spots have already been nabbed. We will have at least 3 teams from the East Coast coming across the country this year to compete for the Jillie (Championship trophy). The reigning champion Young Stars look to repeat as the kings of the streets while regulars such as the Fishsticks, Whompers, Street Rookies, and others look to take the crown. If you have interest in registering a team or sponsoring the event, please see our contact page. Also, follow us on Facebook and Twitter. We will have some new and exciting surprises at this year's event that we will share with everyone closer to the tournament. Might be the most anticipated Labor Day Tournament that San Diego has held yet! Registration open for 19th annual labor day stickball tournament in little italy! May 8, 2017 -- We are officially open for registration for full teams for our 19th Annual Labor Day Stickball tournament in Little Italy. The tournament will run from Saturday, September 2nd through Monday, September 4th. We will have 12-16 teams in this year's event including a few from the East Coast. Please continue to check our website and Facebook page for updated information in the coming weeks. To register, please visit our contact page and email Joey Centanni. It will be $325/team to participate and your team must have matching uniforms for the event. Payment must be made by August 15th to secure a spot. October 9, 2016 -- Good day in San Diego for some delicious Italian food, great weather, and stickball. It was a fun to get some new players out on the street this morning for a few scrimmage games. Thanks to everyone that came out and participated today. We look forward to more events come 2017! Please shoot us an email if you'd like to get on our email list and receive information about future events. Also, please follow us on Facebook (www.facebook.com/sandiegostickball) and Twitter (@SDStickball). September 14, 2016 -- Awesome video about San Diego and New York stickball. Thanks to Brandon, Bobby, and Louie for doing the interviews and breaking it down for all of the viewers. We are excited for another great event on Sunday, October 9th in Little Italy. Pass the video along to anyone that might be interested in coming out to see what the game is like. We also have other video and news in our MEDIA tab. September 14, 2016 -- The Italian Festa will be held on October 9, 2016 in Little Italy. As usual, stickballers will be playing scrimmage games throughout the day on India Street. Instead of our usual Festa Tournament, we will be drafting players around 8:30am on Sunday morning and playing shorter games. The event should last from around 8:30am - 4:00pm. Mixing up all of our regular teams with any new players that want to come out should make it a very even playing field. It will also be beneficial for new players that come out because they will have the opportunity to play with more experienced stickball players. If you would like to come out to play or have any questions, please CLICK HERE to email Joey & Louie Centanni. It will be $5/player to participate in the scrimmage games. We look forward to seeing veteran and rookie players our there! September 4, 2016 -- Another tournament in the books. The Young Stars take the Jillie Trophy home after winning the 18th Annual Labor Day Stickball tournament sponsored by Cortez Sportfishing. Ryan Wilkins was named Bob Ortiz Tournament MVP for the Young Stars. A big story from the weekend was Team Austin. They came into today as the 7-seed and went all the way to the semi finals before running into a hot hitting Fishsticks team. Austin Malone did a great job leading some new players to a 3rd place finish. Noah Barnes, Nick Lally, mini Manny Martinez and Trace Ramos were some of the young guys that held their own on the streets with some veterans. We are very thankful to everyone that helped out this weekend, Joel Hendrickson in particular. He was given the Paul Ortiz Sportsmanship award for his kindness, his compassion, and his ambassadorship for San Diego Stickball over the past 18 years. Our next event will be Columbus Day weekend (Sunday, October 9) where we will have a 1-day tournament on India Street. Come out and enjoy the Italian Festa! September 3, 2016 -- ​Very competitive on the street today. Please check out the schedule for tomorrow. The crowd was awesome today and we expect another big day tomorrow. Games start at 8:30am, so get there early for parking. Below are the first 4 games of the day. It is double-elimination so you lose the first game and you still have a chance. ​We are looking forward to another successful day tomorrow in Little Italy. Visit out Facebook page to look at some pictures! August 29, 2016 -- Our 2016 Labor Day Tournament schedule is out. Some good games throughout the day starting with new team C.F. vs. Kamikaze. Later in the day the Fishsticks will look to take down returning champions the Street Rookies. The entire schedule can be seen on the scheduling page. Please come out Saturday morning around 8:30am as the Pad Squad will be coming out along with some news stations to check it out. We will also hopefully see many of you Friday night at 7:00pm for our Opening Ceremonies at 98 Bottles. For questions, please visit our contact page and send us an email. It should be a great weekend with some great weather! August 24, 2016 -- I wanted to throw out a special thanks to Cortez Sportfishing for being the Title Sponsor for the 18th Annual Labor Day Stickball Tournament in Little Italy. Our goal is to create a great atmosphere for our participants and their families. We would not be able to make this happen without a helping hand. 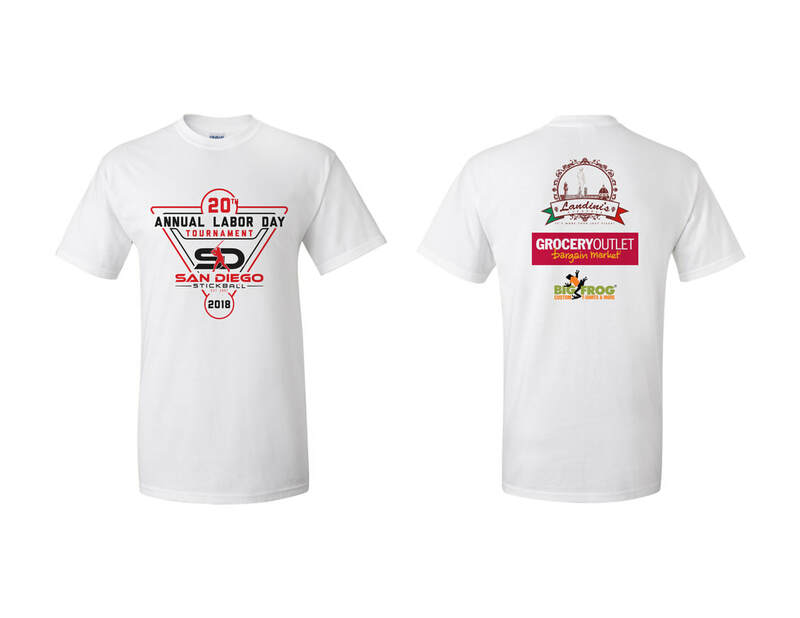 Also a special thanks to our other sponsors Central Coast Disc Golf and, as always, the Little Italy Italy Association! August 17, 2016 -- We have OFFICIALLY finished our logo (I hope). Thanks to Chris Gomez from the Little Italy Association for designing it at a higher quality than we originally had. The Summer is almost over and we are 11 days away from our All League Practice. We are also looking forward to our Opening Ceremonies at 98 Bottles on September 2nd at 7:00pm. We have 8 teams registered and we are not taking any more players or teams. The schedule will be coming out in the next couple of weeks. We are looking forward to getting everyone back together in a few weeks! August 9, 2016 -- San Diego Stickball will be holding an All-League Practice from 12:00pm-3:00pm on Sunday, August 28th at Patrick Henry High School. Please park on Park Ridge and enter through the large gate. You will walk down the hill and see us near the tennis courts. Also, we were asked to make some tutorial videos so new players have something to watch that might give them a better idea of how to play the game. Please check out our YouTube Channel to see our 4 high quality videos! August 3, 2016 -- Opening ceremonies will be held on Friday, September 2nd at 98 Bottles in Little Italy. They will have discounted food and drinks for all Stickball players, friends, and families all night. The party will start at 7:00pm with band Blue Jean Simmons performing at 8:30pm. Fishstick player Louie Centanni will be singing for this group, come check them out! We are very grateful that 98 Bottles is opening their doors for us at their brand new location. 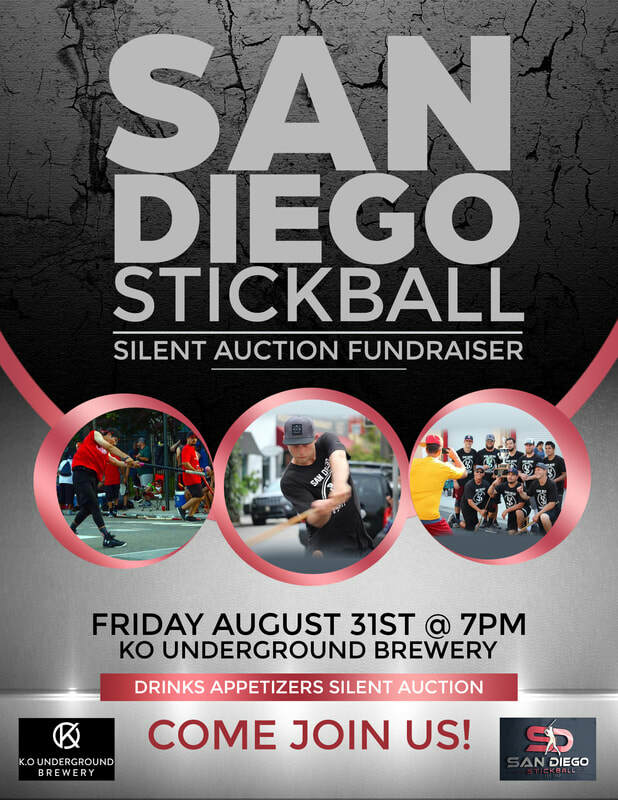 Come support the restaurant, San Diego Stickball, and the band. Lets fill the place up and make it a great evening. Please send an email to Joey Centanni if you have any questions about opening ceremonies or the Labor Day Tournament. let us know what you think of our new logo on facebook! July 28, 2016 -- The new San Diego Stickball logo has been completed! Thanks to Louie Centanni and Goeun Lee for getting that designed. Check us out on Facebook and comment on the new design. We are almost 1 month away from our 18th Annual Labor Day tournament. Come out to Little Italy and check it out. July 21, 2016 -- We are not far away from our 18th Annual Labor Day Stickball Tournament on the streets of Little Italy here in San Diego. San Diego Stickball is starting to make a push throughout Little Italy and we are looking for more sponsorships. We have partnered up with Central Coast Disc Golf, a YouTube channel, that has agreed to come out and get the tournament games filmed live. If you'd like to watch some of their stuff, follow them on YouTube at https://www.youtube.com/user/CentralCoastDiscGolf. Along with aforementioned CCDG, Cortez Sportfishing will be sponsoring the event. We would obviously like to thank the Little Italy Association as well for all they do for us. We are still looking for sponsors, so if you have any interest or know someone that might, please check out our contact page and reach out to Joey Centanni. May 29, 2016 -- After a wet morning on Columbia Street, Championship Sunday started with the Street Rookies beating the Sidewalk Slammers in a strong offensive performance by the SR helping them advance to the Semi-finals. The first semi-final game included 2 strong teams in the Whompers and Young Stars. A promising start in the 1st inning for the Whompers as they put up 3 to take an early lead. Steadily, the Young Stars bats came alive. They took advantage of a couple defensive miscues and beat the powerful Whompers 10-5. The second semi-final game was the Street Rookies taking on the Fishsticks. Not a lot of hitting from either team in this one, but a couple nice plays on defense for the Fishsticks proved to be huge as the Fishsticks pulled out a tight one, 5-4. The Championship game was a standard stickball barn-burner. A mistake in the outfield gave the Young Stars a 1-0 lead on a home run. The Fishsticks came back with 2 runs after a controversial call at the plate. The bats were not producing on either side, but a dropped ball by me (Joey Centanni) followed by a double put the Young Stars up 5-4 and that's where it stayed. Congrats to the Young Stars for taking home the title and also to Daniel and Isaiah for being named Co-MVP's. ​We look forward to seeing everyone on the streets again for Labor Day! May 28, 2016 -- With one day in the books for the San Diego Stickball Memorial Day Classic, the stories today were patience and offense. Patience was required during the 45-minute delay as the first game started on a sad note when one of the SDPD attendants suffered a broken wrist avoiding a flyball. This ended up being the only real tragedy of the day, however, as players and fans enjoyed an exciting first day of games. Early season games in San Diego tend to be defensive clinics, but something must have been in the air this morning as more than half of the games reached double-digit run totals. Maybe the new San Diego Orange balls are a bit harder to catch. Regardless of the reason, when the dust settled, Labor Day defending champion Street Rookies earned the #4 seed, ending the day 1 and 2, and will face the #5 seeded Sidewalk Slammers in a 9 am play-in game tomorrow. The #3 seed went to the Whompers, who also finished 1-2 but had a +6 run differential. The Young Stars brought their prototypical Saturday offense, earning the #2 seed with a 3-0 day. However, their run differential of +12 did not match the Fishsticks, who compiled 36 runs over three games and earned the #1 seed. One highlight of the day included a defensive gem from Scott Deen, snagging a flyball before nearly taking out an F-150, temporarily keeping the Whompers ahead of the Young Stars in what ultimately turned out to be a losing effort. Another highlight featured the Fishsticks, trailing 8 to 5 in the 7th inning, posting a 7-spot to win their first game against the Whompers. Jason Haar's first of three home runs tied the game in the last inning. 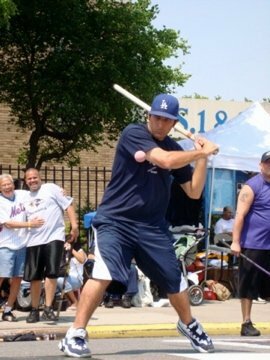 In the following contest, Joey Jennings hammered a grand slam for the Street Rookies in what was ultimately a loss. As we head into Championship Sunday, all games will take place on Columbia Street (Firehouse). Be there at 9:00 am for the play-in game between the Sidewalk Slammers and the Street Rookies. Failing that, come see the rematch between the Whompers and the Young Stars at 10:00 am. Championship game will be at noon. Looking forward to another great day of San Diego Stickball! May 24, 2016 -- The 6-team tournament is set for this weekend. Some of the regular teams along with the new Smashtech guys will be out in the beautiful San Diego sun Saturday and Sunday. Take a look at our schedule link for more information! All teams are to meet on India Street between Ash Street and A Street at 8:30am on 5/28. We also want to wish our East Coast friends good luck in their search for a title in the Memorial Day tournament in the Bronx, NY. March 22, 2016 -- San Diego Stickball will be holding their 1st Annual Little Italy Memorial Day Stickball Tournament. In the past, San Diego has sent teams to the Bronx over Memorial Day to compete with a number of the East Coast teams. This year the leaders of the San Diego league have decided to stay at home in an attempt to bring more awareness to the San Diego game. This tournament will run May 28th & 29th, 2016 on Columbia, State, and India Streets in Little Italy. The event will run from around 9:00am to 5:00pm each day. There are currently 5 teams confirmed and the league is going to keep registration open for 3 more teams. 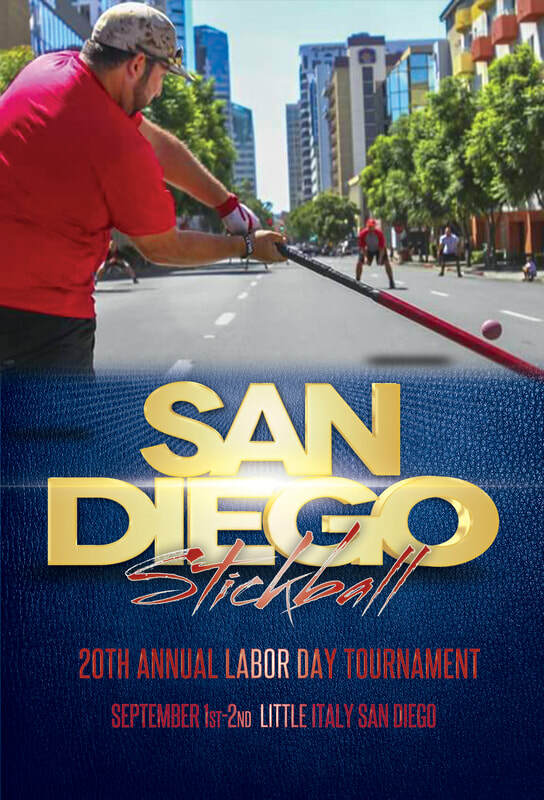 The defending Labor Day Champion Street Rookies will be in attendance along with other San Diego Stickball regulars Sidewalk Slammers, Fishsticks, Whompers, and Young Stars. If you or your friends have any interest in getting a team registered, please check out our Contact page. You may also sign up as a Free Agent and we can try to place you on a team. Street Rookies the new big kids on the block! September 6, 2015 -- After several near-misses in recent years, the Street Rookies have finally toppled the best in San Diego Stickball to place their name on the Jillie. For the next 12 months, they don't have to worry about beating the best -- because they are the best. Their bragging rights come after what was an exciting, albeit brief, weekend on Columbia and India Street. Saturday was a day of the status quo in Little Italy, as the veteran teams fielded by the Shockers and the Young Stars each went 2-0-1 to claim the top two seeds heading into Sunday. The Street Rookies earned the third seed with a 2-1 finish, while the Kamikazes, Asphalt Kings, and Sidewalk Slammers rounded out the competition. 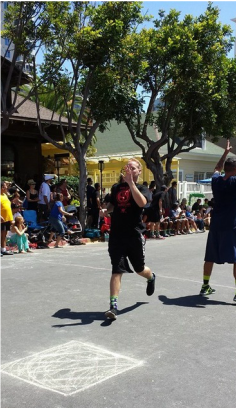 The Street Rookies then proceeded to take the long route to the title, winning all three of their matchups on Championship Sunday. They started by defeating the #6 seeded Sidewalk Slammers -- a team whose only shortcoming may have been their age. Look out for those young men in the coming years, as their strength and energy begin to frustrate the older players on the street. The semifinal round presented them with the toughest challenge yet: the playoff-seasoned Young Stars. The Young Stars may have been missing some key pieces from their teams of the past, but they still displayed a formidable offense -- as they always do -- and an exciting defense led by Izzy, Isaiah, and Vince Blas. The Street Rookies were not intimidated, though, knocking off the 2014 runners-up and advancing to face another San Diego championship fixture: the Shockers. It wouldn't be a stickball championship if there weren't at least a little controversy. The Shockers had a homerun overturned after one of their base runners inadvertently missed first base. The misstep ended up being devastating for momentum, but it might not have mattered anyway. The Street Rookies were too good. They mastered the traditional championship blueprint, playing fundamental defense and getting timely hits, leading to a 3-0 shutout of the Shockers and their first ever Labor Day Championship. The title was a long time coming for Manny Martinez and company, so let's hope they take advantage of the bragging rights. They deserve them. Congratulations! Another congratulations to Vince Blas, winner of the 2015 Paul Ortiz Award. See the article below for more information on one of San Diego Stickball's true gentlemen. It won't be long until the teams are back to exact revenge on the Street Rookies, as the one-day Festa tournament will be held on Columbus Day in October. The early returns already show that most teams plan on returning, so please be in touch if you're interested in entering! 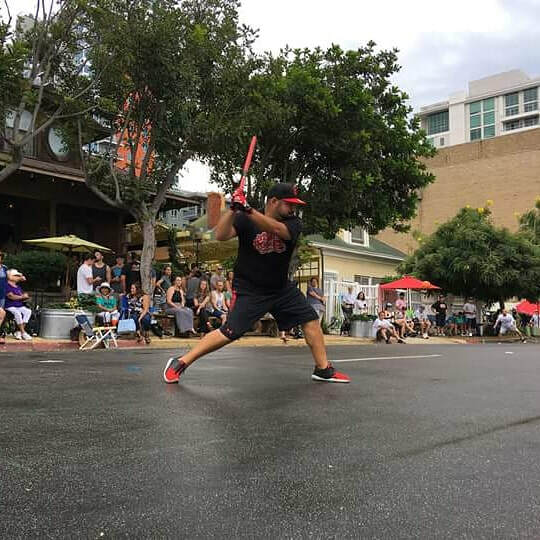 September 6, 2015 -- For those who have played, or even witnessed, stickball on the streets of San Diego, few people personify the ideals of our game better than Paul Ortiz. With goggles and wristbands at the ready, Paul has manned third base for several championship teams in San Diego. His unparalleled intensity may only be matched by his sense of friendliness and fairness. He is a representation of all that is good in stickball -- and really, in people. Last year, his character and his efforts finally received recognition with the implementation of the Paul Ortiz Sportsmanship award, which will now be given annually to a player whose contributions to stickball are founded in fair play, intensity, kindness, and brotherhood. The first recipient of this year's award is someone who very easily could have had his name on the initial trophy: Vince Blas of the Young Stars. For nearly 20 years, "Vinny" has been a fixture on Columbia Street. Originally a member of the San Diego Knights, he made a name for himself with some of the most consistent outfield hands in the game. Opponents hated hitting line drives to left-mid outfield, because they knew when Vince roamed the streets it was as good as a strikeout. He has also been known for his clutch hitting and veteran savvy. It's no surprise that many of his teams have competed for -- and often won -- championships. Vince eventually took his talents to the Whompers (now Shockers) for several years before landing on the Young Stars with his sons, Isaiah and Izzy. Perhaps more important than Vince's contributions on the field are the things he does between innings. His laid-back demeanor calms even the most enraged opponents, and his sense of fairness and honor are indisputable. You would be hard-pressed to find anyone who can recall Vince engaging in an argument on the block. He seeks not what is best for him, but what is right, on every single occasion. When it came time to vote for the 2015 Paul Ortiz recipient, the discussion lasted all of 15 seconds. That's not an exaggeration. When Vince's name was mentioned, the conversation turned elsewhere, because the panel unanimously agreed that Vince Blas deserved to be honored for all that he brings to San Diego Stickball. Congratulations to Vince, but more than that: THANK YOU for always bringing an intensity and passion to a game defined by those traits, and for always serving as an ideal role model for all of the players and fans on Columbia Street. We are more than lucky to have you in our league. August 23, 2015 -- Be there on Saturday, September 5th and Sunday, September 6th to catch all the action on Columbia Street (between Beech and Cedar) and India Street (between A and Ash)! With the reigning champion San Diego Fishsticks out of the tournament, there is guaranteed to be a new champion. Don't miss a game! June 1, 2015 -- With fierce competition in each of the qualifying Saturday and Sunday games, San Diego slipped into the final seed for a Monday berth. The bats took a few games to get going, and an opening loss followed by a deflating tie left San Diego with a lot to prove on Sunday. As it turned out, they were up to the challenge, winning two of three -- doing just barely enough to eke into the 8 seed. On Monday, San Diego came out hot early, putting up a few runs in the second inning against the Jersey Saints. However, the sleepy bats came back and the Fishsticks were fortunate to win a heart-stopping one-run game to advance to the semi-finals. Unfortunately, their luck would end there. Two controversial calls went against the Fishsticks and an injury to slugger Joey Centanni took a lot of the wind out of their sails. After pulling some starters in the Top of the 7th inning, the bats came alive as Paul Ortiz led a 4-run rally that came up just short in a 5-4 loss. Overall, the team took 4th place. April 6, 2015 -- There have only been two times that a San Diego team has won a championship on our home turf when New York teams competed here. The first came in 2008, when the Whompers sent a highly talented Bronx Gold team home with an 8-0 victory on Championship Monday. The second time was last September, when the Fishsticks beat the "undefeated curse" and won all nine games en route to the Jillie Trophy. Now, the rivalry heads back to its birthplace. On May 23, 24, and 25, the San Diego Fishsticks will defend their stickball pedigree against teams from New York, Florida, and Puerto Rico on the streets of Bronx, NY. Stickball Blvd. will be overloaded with passion, excitement, and competition, but the San Diego team will only have one thing on its mind: becoming the first San Diego-based team to ever bring home the hardware in the Memorial Day tournament. San Diego has always been able to compete with New York -- even though we play only two weekends a year compared to their weekly three month season. However, simply competing is no longer the goal. This year, San Diego has only one goal: to have our city spray-painted onto the mural at Stickball Blvd. 2) The 2014 Labor Day Tournament Champion San Diego Fishsticks have assembled a roster to send to the 2015 Memorial Day Tournament in Bronx, NY. The roster is comprised of a handful of Fishsticks mixed with a complement of San Diego All-Stars. The official roster will not be set until closer to the tournament, but in addition to the returning members, the additions consist of members from the Shockers, the Youngstars, and the St. Sluggers. 3) Expect an e-mail about a late-March, early-April event on the streets of Little Italy. In the meantime, enjoy the offseason! October 13, 2014 -- Yesterday was the annual Festa Stickball Tournament in Little Italy, San Diego. Great start to the day when the Kamikaze almost pulled off a huge upset over the Young Stars. The Young Stars ended up tying the game with 2 outs in the last inning with a home run and the game finished in a 3-3 tie. Later in the day the constantly improving Rookies took a 1-run lead into the last inning against the Labor Day Champion Fishsticks. With 1 out in the final frame, Louie Centanni drove in 2 runs with a double to lead the Fishsticks to a 2-1 victory. In the final game before the championship, the Shockers were looking to upset the Fishsticks. In the last inning, a defensive mistake led to a run and the Shockers went on to defeat the Fishsticks 3-2. The championship game was a defensive battle between the Young Stars and the Shockers. A 2-run home run by MVP Scott Deen proved to be the game changing play as the Shockers won in a 2-1 game. Yesterday was the largest Festa tournament San Diego Stickball has had. Eight teams participated in the growing sport and there were hundreds of fans walking the streets stopping to check out the games. It was a successful day for the Shockers and for stickball in general. October 7, 2014 -- We are 5 days away from the 2014 Festa Stickball Tournament in Little Italy (Sunday, October 12). Games will start at 9:00am and the championship will be at 3:15pm. Please come out to eat some delicious food and watch some fun and competitive stickball games on the street! September 18, 2014 -- With stickball gaining momentum throughout California, we have already had 7 teams register for our Annual Festa Tournament on Sunday, October 12th. This tournament takes place during the Italian Festival and there are thousands of people on the streets celebrating their heritage and amazing food. September 3, 2014 -- Just two days after the final out of the stickball tournament, energy for the sport still remains high in San Diego. Tournament directors Louie and Joey Centanni have already received interest from five teams for the one-day Festa tournament in October, forcing them to petition the city for an extra street block. Additionally, several fans and hopeful players have been in touch about getting involved in the sport. It is a good time to be a stickball supporter in San Diego. Perhaps most surprisingly, University of the Pacific head baseball coach (and former MLB All-Star) Ed Sprague has taken a liking to our sport, asking his assistant coach (Joey) to help implement the sport into their training program. Believing it to be something that can help his players prepare for the demands of baseball, it is just greater evidence that stickball is more than just a silly game. Keep spreading the word about stickball on the West Coast and let's make sure we can build up the foundation once again so we can continue to compete against the great teams from New York! September 1, 2014 -- The opening games began with slight controversy as the No Parking signs were removed the night before and Lasorda Field (Church) had to be modified. However, as true stickballers, the show went on. In the morning games, the Asphalt Kings and the Bronx Gold played a back and forth game that entered the top half of the 7th with a 7-6 advantage for the San Diego team. This, however, was nothing new for the veteran Gold, who proceeded to put up 6 runs in the top half and eliminate their counterparts. On DiMaggio Field (Firehouse), the Royals and Rough Riders played an extremely tight game -- highlighted by a head-long diving catch in mid-outfield by the Rough Riders (turned into a double play). However, after Rough Riders' second baseman dislocated his shoulder throwing a ball, the energy seemed to deflate and the Royals scored 8 runs in the bottom of the 5th to guarantee a berth in round two. Once the 11 am games began, the streets were filled with fans. The top-seeded Fishsticks brought their lumber once more, putting up enough runs to stave off elimination against the Bronx Ravens, who fought valiantly. The Ravens brought the potential go-ahead run to the plate in the final frame, only to fly out to end the game. Meanwhile, the Youngstars and Shockers played a battle that ended in a 7-2 victory for the hard-hitting Youngstars. The semifinals brought high intensity as each game featured a Bronx team against a San Diego opponent. The Youngstars battled the Bronx Royals, scoring enough to secure a spot in the championship. On the other field, the Fishsticks defeated the Bronx Gold to set up the first ever all-San Diego championship (in tournaments featuring out-of-town teams). The championship game pitted two of the best hitting teams in stickball against one another. Fans thought they'd be in for a barn-burner after Chris Urteaga led off the game with a home run for the Youngstars, but the defenses began to shine. The score was knotted at 1 into the 5th inning when the Fishsticks took the lead. The Youngstars threatened in the 6th inning, but were held to a single run after a strikeout ended the inning. After letting their bats do the talking all weekend, the Fishsticks rallied to score three runs in their final at-bats -- securing their second consecutive Labor Day title and beating the "undefeated curse," going 9-0 in the tournament. Pat Colwell earned MVP honors for the tournament, playing some of the best third base in stickball and having a hand in four of the six runs during the championship game. Thanks to everyone for coming out this weekend and we look forward to the New York Memorial Day tournament! Sunday proved to be "One-Run Sunday," as eight games ended with a one-run differential. As is often the case, bats tended to fall asleep in the final match ups. The highlight of the day was undoubtedly the young West Coasters walking off on the Bronx Royals in their final game of the tournament. They might not have made Monday, but they will certainly be a force to be reckoned with as those boys turn to men. In other walk-off news, the Ravens cheated elimination by stringing together four straight hits in the bottom of the 7th inning against the Kamikazes. Had the Kamikazes held on, it would have been a long flight back to New York. Meanwhile, the Fishsticks maintained their undefeated status as, trailing by one with two outs in the bottom of the 7th, Jason Haar put a charge into a walk-off two-run homerun. It is rare that a stickball tournament boasts six teams with 4 or more wins. That goes to show how far stickball is continuing to come on the Best Coast. Don't miss Championship Monday, where energy will certainly be high, and teams will be running on fumes in order to win the Jillie Trophy! The tournament is underway. Check back frequently for updates, or follow @SDStickball on Twitter! Less than a week to first "pitch"! Come out to Little Italy this Saturday for the first set of games for the 16th Annual Little Italy Stickball Invitational!